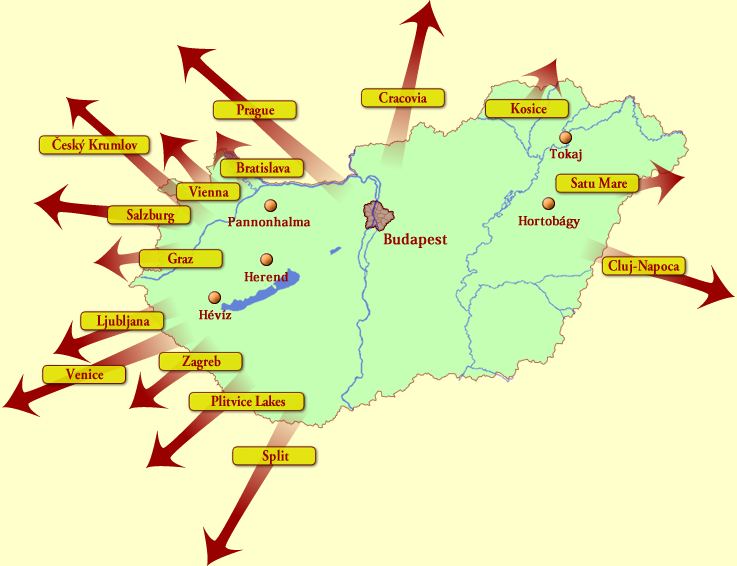 If you wish to travel to the neighbouring countries from Hungary (or from them to Hungary) by car or minibus, you can order this service on this page. Please find the map below containing the most popular destinations. In case you cannot find the place you would like to visit, please write us an e-mail. We offer transfer anywhere within 800 kilometres to the following countries: Austria. Czech Republic, Croatia, Poland, Germany, Italy, Slovakia, Slovenia. Based on the number of passengers you can choose a car (1-3 persons) or a minibus (4-12 persons). There are different speedlimits for cars and minibuses therefore duration of travelling may differ. When calculating expected travelling time, we include a 15 minute break for every 2 hours. Bad weather or passport check (for non-Schenegen countries) may increase travelling time. We provide an English-speaking driver, who is flexible with passengers’ requests. In case you wish extra comfort, we provide a car of „de Luxe” category for you. By paying the reservation fee I accept the following terms of reservation and cancellation . Please reserve your journey at least 5 days prior to travelling. In case you order departure from Budapest, please pay 20% of your fare in advance on our website with credit card. The system will send confirmation of the payment. In case you order transfer to Hungary, advance payment is 50%. The remaining part of the payment is to be made to the driver in cash. The driver will give an invoice of the amount. You can cancel the ordered journey 3 days prior to the reserved day. We reimburse the amount of advance payment, only deducting money transfer fee. In case of cancellation within 3 days or „no show” we cannot return the deposit but you do not need to pay the rest of the amount. You can modify the time of the departure 24 hour prior to the travelling at the latest (with maximum 4 hours) free of charge. Although you do not need to present your passport at most border-crossings, you must have your passport or other document of identification with you in every country. Since it is our aim that you spend your time in our country as usefully and as coveniently as possible, we are ready to stop wherever you wish on the way. There is also an opportunity to take a detour because of a beautiful scenery or take a sightseeing tour to see an interesting town. Maximun 2 hours of stopping (for taking photographs or short walk in a town on the way) is free. 1. 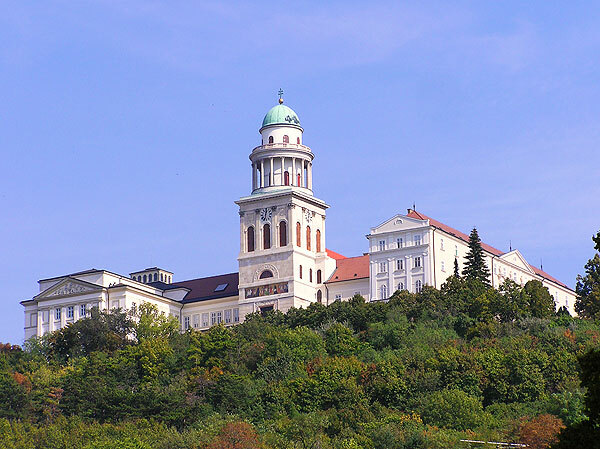 Visiting the Abbey of Pannonhalma between Vienna and Budapest means a short detour and about 2 hours extra time. The Abbey is part of the World Heritage it will give you an experience of a lifetime. 2. When travelling to Graz visiting the Porcelain Manufactury in Herend only takes extra 90 minutes. It is on the way, highly recommended. 3. 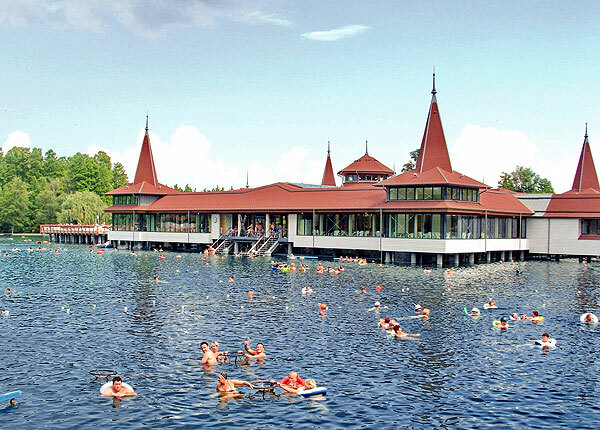 On the way to Zagreb or Ljubljana there is an opportunity to see the Festetich Castle in Keszthely with a short detour and have a bath in the thermal water of Hévíz. It is a wonderful experience. E- mail:* Please keep empty! I can check my e-mails until (day) of (month) in my house. By clicking here you come to a page where you will find the program chosen by you. Please check the ordering data.